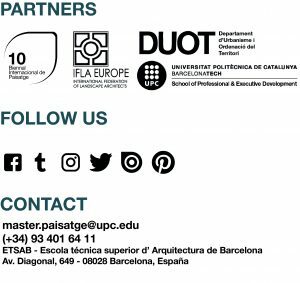 RECENT BOOKS – Master in Landscape Architecture Barcelona – Universitat Politècnica de Catalunya – 35ª EDITION. Last February two books of thought on landscape have been published in Italy. Franco Zagari, who we heard at the COAC conference on January 31st within our Green Systems Workshops, presented under the title: LA PAROLA AI PROGETTI, a book that reviews all his work of landscape architecture from a personal and intimate perspective. Franco Zagari is an architect and landscape architect, currently guest lecturer in the University La Sapienza in Rome. He was teaching professor at the Università Mediterranea di Reggio Calabria, where he was also director and the founder of the OASI department and the coordinator of the phd in gardens architecture, gardens and management of the territory. He was nominated Chevalier des Arts et Lettres for the Ministry of Culture of France in 1998, for the Gubbio Prize in 2009. He was president of the Jury for the VI European Biennial of Landscape of Barcelona in 2010, honourable member of AIAPP in 2010, winner of the Grande Albero del Paesaggio Italiano Prize in 2013, and with Romarchitettura Premio alla Carriera di Architetto in 2014. His projects can be found in Italy, France, Scotland, Georgia, Japan and Jordania. He also wrote different books and films, such as “L’architettura del giardino contemporaneo”, one exposition, six RAI films, in Milano 1998. He also wrote “Questo é paesaggio”, 48 Definizioni, Roma, 2006, “Paesaggi di cittá non cittá. Franco Zagari, Quattro progetti di ricerca”, edited by Giovanni Laganà, Melfi, 2012. Achille Maria Ippolito, who will be in charge of carrying out the INTERNATIONAL INTENSIVE II workshop next May, has presented under the title: PENSIERI DI PAESAGGIO, a book that investigates the urban landscape in relation to the definition given by the European Council of Landscape. Achille Maria Ippolito graduated in the Faculty of Architecture of Rome, where he started his teaching and research activity. He focuses on the design methodology, with its language and diverse characteristics. He wrote different books (Roma Costruita in 1983, Il Vuoto Progettato in 1996, Notomia di 7 Opere in 2000, Il Parco Urbano Contemporaneo in 2006) and gave his collaboration to other important books (such as the Enciclopedia Italiana Treccani, in 1991/95). With his theoretical research, he also developed a design one, working on different national and international competitions, constructing housing, churches, hotels, offices, always trying to give an evolutional contribution at the project. Through a deep understanding of the composition of space, he tries to overcome the rational style to create a rigorous complexity.